The Washington Post reports that United Arab Emirates officials knew about the hacking attack on a Qatari news agency. Qatar and the United Arab Emirates are locked in a fresh diplomatic tussle — this time over hacking and fake news. The trouble started when Qatar's state-run news agency published a false article back in May, claiming the country's leader had praised Iran and Hamas. The fake report helped drive a diplomatic wedge between Qatar and its neighbors. The news agency later said the article was posted due to a site hack — which a new report blames on the UAE. According to The Washington Post, senior UAE officials discussed planting the article in Qatari media. The Post notes the UAE might have employed a third party, which could explain previous reports that Russia was behind the hack. Qatar has jumped on the Post's report, accusing the UAE of violating international law. For its part, the UAE has denied having anything to do with the attack. The fresh fiasco complicates U.S. efforts to smooth over the crisis. 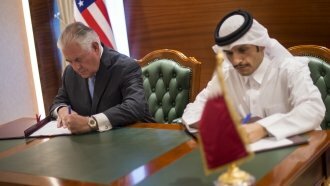 Secretary of State Rex Tillerson spent part of last week in the region trying to resolve the dispute.